In a 10-inch cast iron skillet, spread softened butter. Sprinkle sugar overtop of the butter. In the centre of the pan place the cinnamon stick, star anise and 1 tsp vanilla extract. 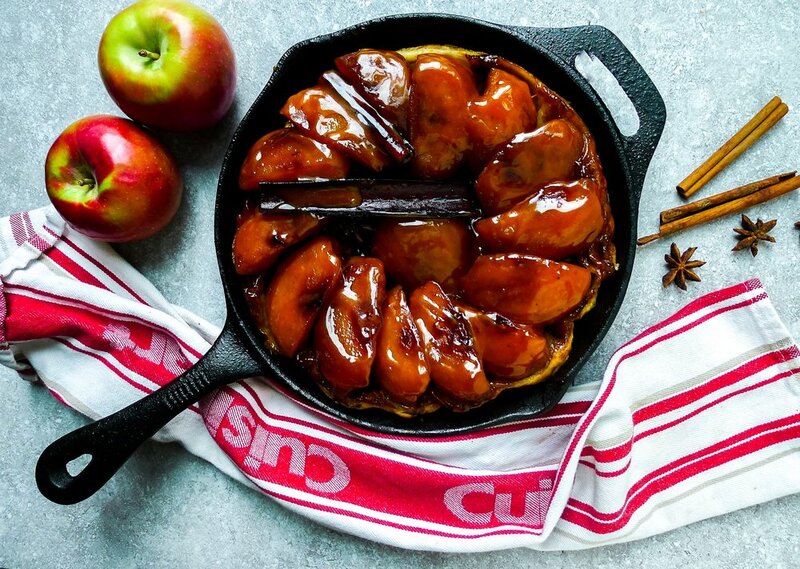 Take cored apples and line up around the edge of the pan wedging them as close as possible (as they will shrink while they cook). Note* I wedge them by placing the cored side facing the next apple and so on until you come full circle. Place 1-2 apple halves in the very centre. Lightly dust counter with flour. Take rolled puff pastry sheet and dock the dough with a fork. (if you can’t find pre-rolled sheets, be sure to roll your dough approximately 1/4 of an inch thick!) Using a plate (approximately 1/2 inch wider than your cast iron skillet) cut a disk of the rolled puff pastry sheet. Score the centre of the disk with an 1.5 inch “X” . Place the disk on top of the apples and carefully tuck it down the edges. to ensure it stays in place while cooking (see photo below). Place the whole skillet on the stove over medium-high heat. And allow the juice from the apples to start forming a caramel. Let cook for 7-10 minutes, checking regularly to ensure the caramel is cooking evenly under the apples. After 10 minutes, Carefully ensure the apples are not sticking to the pan. Carefully loosen the apples if any stickage is occurring. Rotate the whole tarte within the pan to allow even cooking and caramelization. Continue cooking until the caramel is a deep amber and starting to thicken (you can check this by carefully spooning some of the caramel bubbling around the edges onto a white plate). Approximately 5-10 minutes. NOTE* CONTINUE CHECKING THROUGHOUT as this can burn quite quickly. Remove from the heat and place skillet in the oven. Bake for 20-25 minutes or until the puff pastry is puffed and and starting to browned. Lower oven to 350°F and continue baking for 15-20 minutes or until the apples are soft and the pastry is golden brown. Let sit 5-10 minutes before serving. Place sugar and water into a medium heavy bottomed saucepan. Stir to combine, and place over medium heat and allow sugar to fully dissolve. Once sugar has dissolved, increase temperature to high heat and allow the sugar to start bubbling and caramelizing. Once the sugar mixture has become a deep amber caramel colour, remove from heat and whisk in softened butter in 2-3 inclusions. NOTE* BE CAREFUL as the caramel tends to spit! Once the butter is fully combined, whisk in the heavy cream in two inclusions, Whisk until smooth! Add the salt and spices and keep warm over medium low heat until ready to serve. Take warmed tart. Ensure the tart is loose and the apples are not sticking. Place a large plate over top of the skillet. Quickly flip to remove tart. Generously brush tart with warmed caramel. Serve with a big scoop of your favourite vanilla ice cream! (Drizzle with more caramel if desired because WHY NOT).